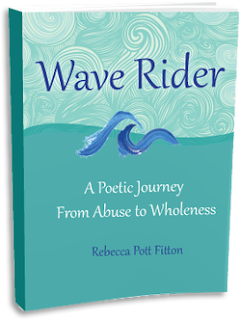 Wave Rider: A Poetic Journey From Abuse to Wholeness is a poetic reflection of author Rebecca Fitton’s long journey to heal from sexual abuse, abandonment, and neglect, building a new world based on wholeness of body, mind, and spirit. Her journey has taken a lifetime. To use the metaphor of waves, sometimes the undertow nearly drowned her—but she survived. Now her beautiful and profound book offers inspiration to others who have also suffered greatly from abuse. "It is said that the longest journey begins with the first step. Truthfully, something precedes the first step: saying “yes” to the journey. In her book of poems, Rebecca invites us into her journey—one that says a resounding “yes” to life and an emphatic “no” to abuse. Her voice found through poetry, Rebecca speaks with courage, determination, and delight. My life-journey is the richer after reading her poems." —Paul Chitwood, L.M.T. Wave Rider: A Poetic Journey from Abuse to Wholeness is available in on Amazon, Barnes & Noble, and IndieBound. To win a copy of Wave Rider, please enter using the Rafflecopter form at the bottom of this post. The giveaway contest closes Sunday, February 5th at 11:59 PM EST. We will announce the winner the next day in the Rafflecopter widget. Good luck! WOW: Thank you so much for sharing your life with us Rebecca. Wave Rider is absolutely beautiful. What prompted you to share your story with the world? Rebecca: A shift of visual perspective prompted me to write my first poem. I was at a New Moon Retreat on a friend’s property located in the foothills south of Santa Fe. The vistas are spectacular from that site. As part of each gathering, we spent time out on the land individually and silently. That day in July 2009, I looked closely at a juniper tree that was immediately in front of me rather than gazing into the distance. Then I wrote the poem “Crones” and read it to the gathering of women when we returned. The poem compared junipers to crones. They were amazed, and so was I. The next month at the gathering, I wrote “Coming to Santa Fe.” My writing had begun. WOW: Sounds like your friends and the retreats were very influential, but please tell us more about what and who influenced you and in what ways. Rebecca: My spiritual journey was influenced by the writing of women including Jean Shinoda Bolan, Lauren Artress, Marion Zimmer Bradley, Barbara Ann Brennan, Starhawk and many others. As a writer Jean Shinoda Bolan had the most influence because she is a Jungian psychiatrist, and I was on a healing journey. She also wrote a lot of books. Women’s circles also influenced my journey. In the 1980s I was a member of Unitarian Universalist congregations. The Church supported women’s spirituality through a curriculum, and we added our unique strengths and perspectives. We read and discussed books about goddesses, created rituals for solstices and equinoxes, and spoke our truths in services we presented to the congregations. These experiences were rites of passage. My healers, whom I identify in the ‘Acknowledgements and Gratitude’ section of Wave Rider, were my primary influence. I knew that I needed serious professional help, and I was fortunate enough to enlist competent, empathetic professionals. My poem “Teacher” reflects how I feel about them. They set me free to be me. WOW: I was excited to learn about a song that was written just for you. Tell us how you felt when you first heard Santa Fe Winds. 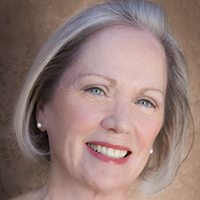 Rebecca: I was absolutely thrilled to receive “Santa Fe Winds” from my cousins. My cousin John has ‘had my back’ for most of my adult life, and here he was again with his wife Lois. I was amazed how perfect the lyrics were for me because they had not yet visited Santa Fe. I always cherish gifts made from the heart. This time, it was a gift of music; and I am so honored to have been the recipient. WOW: You are certainly brave. A book, a song, truly unstoppable! Sometimes choosing a publisher can be daunting, but even that didn’t stop you. Tell us though, how did you go about choosing a publisher? Rebecca: I choose new resources through existing resources. I had begun chatting with friends about publishing and asked for their opinions. Here in Santa Fe we like to shop locally. One friend suggested that I consider Terra Nova Books. She knew the publisher and was confident in his honesty, integrity and professionalism. Scott and I met for coffee and conversation. He was forthright and encouraging. One of his suggestions was to contact Artotems, a marketing firm. After more coffee and conversation, I decided to submit my formal proposal to Terra Nova Books which they accepted immediately. WOW: Your story just gets better and better. You’ve got so much to share. What advice or words of wisdom would you give others who are looking at publishing their story? Rebecca: The only advice I have to offer is do not self-publish because you do not have access to distribution channels. Many bookstores will not carry self-published books. Because I like face-to-face conversations (I am so old fashioned), having my publisher in the same city works for me. WOW: What’s next for you? Rebecca: Whatever the universe brings. I continue to write poetry and am having fun. WOW: Thank you so much for choosing WOW! We appreciate your time and honesty. This is sure to be an inspirational tour! Lisa Haselton interviews Rebecca Fitton about her book Wave Rider, a poetic journey from abuse to wholeness. Madeline Sharples reviews Wave Rider by Rebecca Fitton. Stop by Madeline's blog, Choices, and find out more about this poetic journey from abuse to wholeness. Crystal J. Casavant-Otto shares her review after reading the poetic journey of Rebecca Fitton in Wave Rider. Sioux reviews Wave Rider by Rebecca Fitton. Stop at Sioux's Page to learn more about Rebecca and this touching and poetic journey from abuse to wholeness. Wisconsin business owner and avid reader Penny Harrison shares her thoughts and feelings about the poetic journey of Rebecca Fitton. Michelle DelPonte shares her review of Rebecca Fitton's Wave Rider today at Bring on Lemons. Don't miss this exciting blog stop and book giveaway. MC Simon reviews Wave Rider by Rebecca Fitton for readers at Writers Pay it Forward. Don't miss this honest review of this touching and poetic journey. Avid reader and book enthusiast Tange Dudet shares her thoughts and feelings after reading the touching and poetic journey of Rebecca Fitton as she went from a life of abuse to wholeness. Cindi Ashbeck shares her thoughts and feelings after reading the moving story Wave Rider by Rebecca Fitton. Wisconsin mom, foster mom, wife, babywearing enthusiast, and business owner Tara Forst reads and review Wave Rider by Rebecca Fitton. Author and radio personality David W Berner reviews Rebecca Fitton’s book Wave Rider and shares his thoughts with readers at The Constant Story. Enter to win a copy of Wave Rider by Rebecca Fitton! Just fill out the Rafflecopter form below. We will announce the winner in the Rafflecopter widget next Monday, February 6th. Rebecca--I've read several memoirs that are written in the form of poetry, and memoir is my favorite genre, so I was excited to be able to review your book. Good luck with your book sales, and I'll write more on Friday. Thank you for sharing your publishing journey, Rebecca! I love the combination of memoir and poetry. Good luck on your tour!